Retro gaming on the road. The versatile 8bitdo N30 Pro is a controller built for retro gaming fans that swap systems a lot. Editor's note, October 19, 2017: 8bitdo has changed the name of this product from NES30 Pro to N30 Pro. Sure, many PC gamers swear by their mouse and keyboard, but sometimes you just need a controller. In a world of dominated by Xbox One and PlayStation 4 controllers, 8bitdo has stepped into the foray with the N30 Pro ($43 on Amazon). It’s a marriage of contemporary functionality and classic design, at a fraction of the size of most modern controllers. 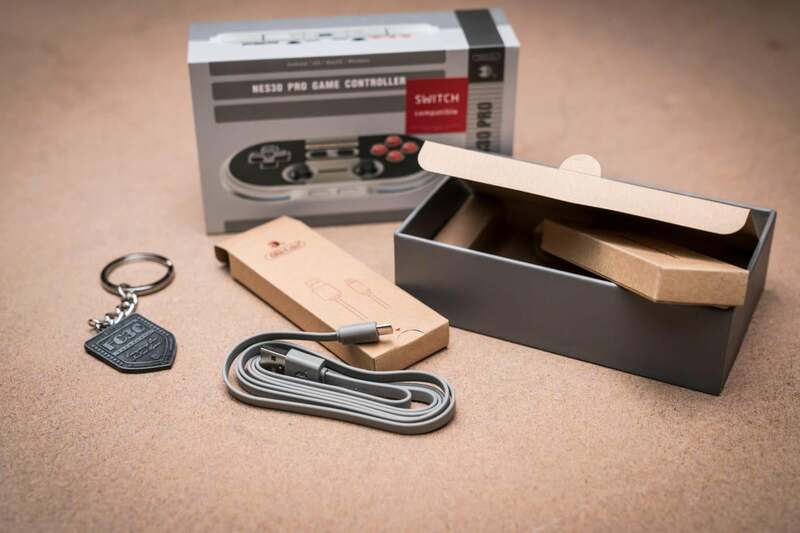 8bitdo makes other gamepads (including the NES30 and SNES30) to varying degrees of success. But the N30 Pro is the flagship product, designed to appeal to retro, indie, and blockbuster gamers alike—a tall order. 8bitdo also chose to make the controller small and portable, and that decision has consequences for PC gamers. The N30 Pro is a fraction of the size of the Xbox One controller, but its portability comes at a price. Before we go over what it’s like to use, let’s go over specs. 8bitdo’s N30 Pro connects via Bluetooth 4.0 or an included micro-USB cable. I tested it on a Windows 10 machine but it’s compatible with Windows 7 and above. It’s also compatible with Android, MacOS, SteamOS, and the Nintendo Switch. Raspberry Pi and older systems are supported via ‘Legacy Firmware.’ Pairing the controller with your PC is simple, with a dedicated button on the bottom of the controller. Once paired I didn’t have any connectivity problems even though I have a couple Bluetooth devices around my desk. The N30 Pro packs a 480mAh rechargeable battery rated for 18 hours of playtime, which held up in testing. Recharging it via USB was painless since my PC sits on my desk and the controller only takes 1 to 2 hours to fully charge. Having an integrated battery helps the controller stay slim and light, but it's part of the trade off I mentioned earlier. I prefer replaceable batteries in my controllers, especially if it’s only going to live at home. LEDs line the edge of the N30 Pro, giving off a nice ambient glow. 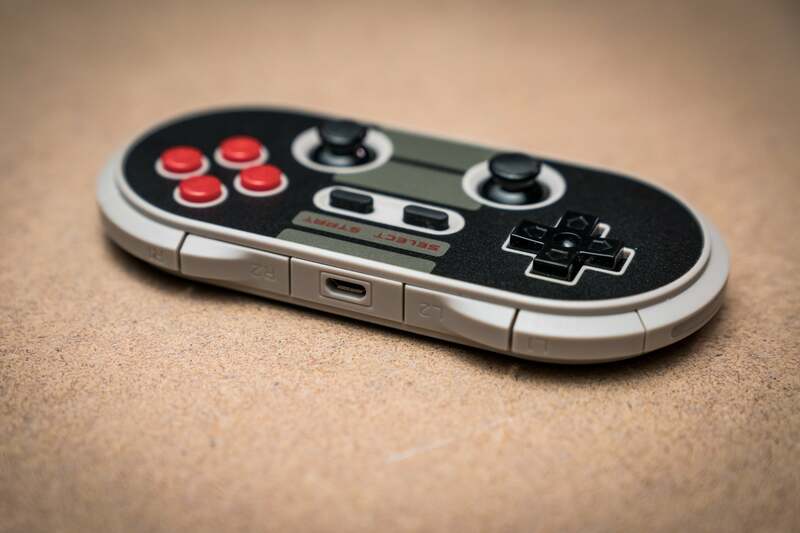 One of the N30 Pro’s appeals is a design that hearkens back to the classic Nintendo Entertainment System from the 80s. The familiar black and grey with accents of red brings back thoughts of staying up into the wee hours trying to beat Castlevania. But the similarities end with the color scheme and font layout. Instead of a blocky rectangle, the NES30 Pro rounds the corners to create pill shape. Embedded around both ends are led lights indicating when the controller is on, when it’s in paired mode, and more. The directional pad is better than the Xbox One’s controller's and the face buttons are just as good, emitting a satisfying click when depressed. The NES30 Pro's D-pad, start/select, and face buttons also sit higher to make room for two thumbsticks. Speaking of the thumbsticks, I wasn’t too impressed. They aren’t as bad as Sony’s PSP sliding abominations or the tiny Nintendo 3DS nub, but they're also nowhere near as good as thumbsticks on a full-sized controller. The springs have a bit too much resistance to them and don’t provide that natural flow between a neutral state and fully slid. It’s really hard to get a clean click in for L3 and R3 prompts, too. All the issues seem to stem from the NES30 Pro's small size. The four small, cramped buttons on the bottom of the NES30 Pro are a recipe for accidental buttons presses. 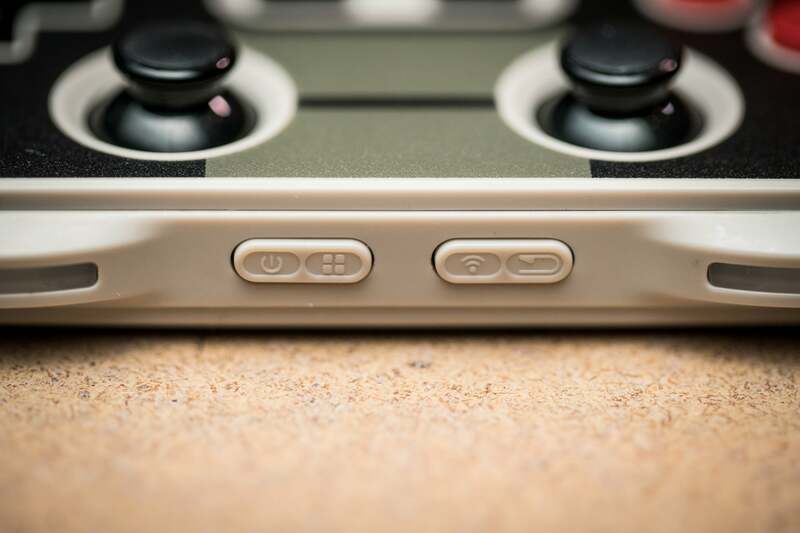 Four extra buttons sit on the bottom of the controller, paired off into two little ovals: One for power, one that acts as a home button, one to start Bluetooth pairing, and a back button. They're very close together, which resulted in my multiple accidental button presses. But it’s the bumper placements that truly took some getting used to. Four bumpers on such a slim controller causes headaches. 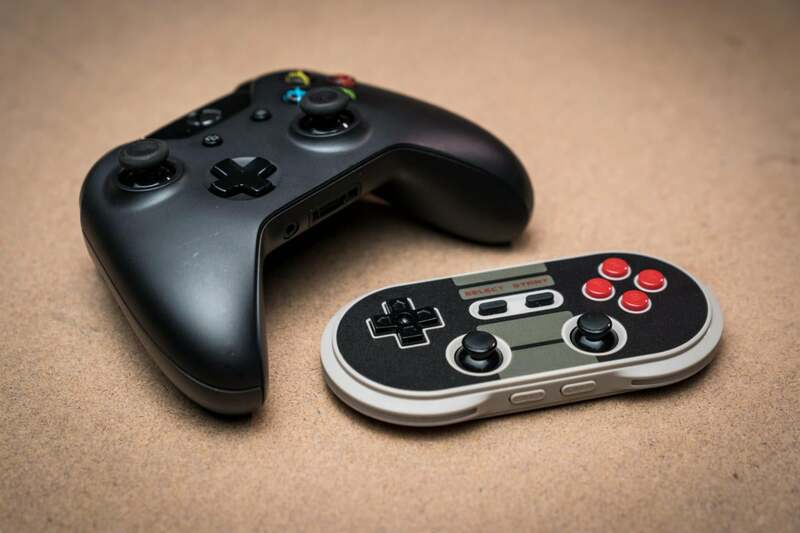 Instead of miming contemporary rivals by stacking rows of bumpers, 8bitdo opted for a side-by-side design that essentially splits one large bumper on each side into two discrete bumpers. Looking at it from above, you see them labeled L1, L2, R2, and R1 from left to right. Sitting in my hand it meant that L2 and R2 were under my fingertips and L1 and R1 were knuckles. I either had to pull my fingertips out to access the first pair or try to awkwardly press them with the middle of my finger. In order to get four bumpers on the N30 Pro, 8bitdo chose to put them all side-by-side. While it’s not much of a problem if you are playing emulated games that only use one set, my brain had a hard time connecting with the placement. Playing a traditional shooter like Call of Duty means pulling a left trigger to aim down the sights and the right trigger to fire. The minute button presses on the N30 Pro bumpers never felt as good, or as natural, as you get with an Xbox or PlayStation controller. It was even worse in The Witcher 3, which requires you to use all the bumpers to activate your Witcher Senses or bring up your spells. The NES30 Pro's awkward bumper placement just left me feeling confused most of the time—especially when the on-screen prompts show the inputs for an Xbox One controller. Speaking of controller prompts, the engraved face buttons align to Nintendo controller configurations rather than the ones that PC games register as X-input prompts. This means that both X and Y as well as A and B are swapped compared to what you'll actually see on-screen in modern titles, another huge mental hurdle. 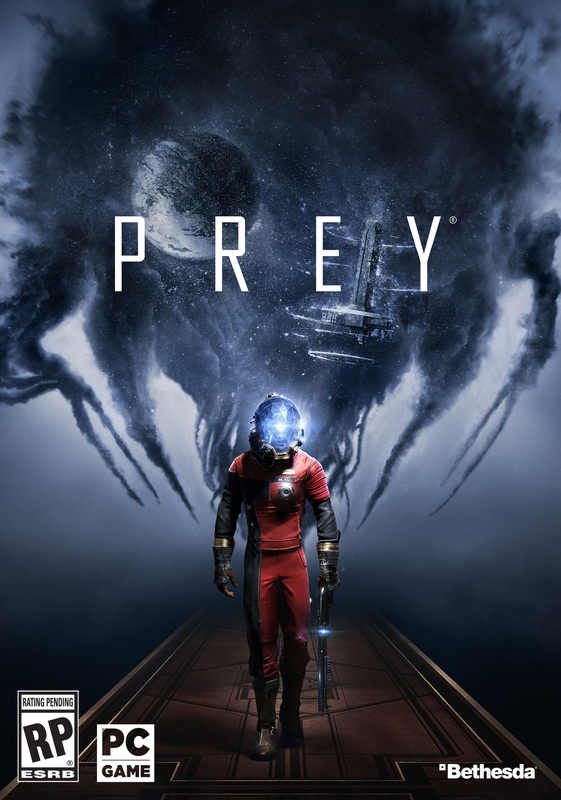 I needed to retrain my brain if I loaded up Prey right after playing Super Mario World. Both the bumpers and the button designations took a while for me to get over, and still hang me up if I’m not thinking about it. The N30 Pro looks and feels great, but it's meant to be portable, meaning 8bitdo had to make some sacrifices. But the real question is whether you are willing to trade things like awkward bumper placement, mediocre thumbsticks, and an integrated battery for having a controller you can slip in your pocket or easily shove in a backpack. The compromises are necessary when they're integrated into a portable handheld system like Nintendo's 3DS XL ($175 on Amazon), but they're far less tolerable for a discrete controller if you plan to mostly use it at home. Buying 8bitdo's N30 Pro only really makes sense if you need a portable controller that will work for many systems. While testing the N30 Pro I took it to and from work and used it on a variety of systems, including two separate PCs and a Nintendo Switch ($300 at Best Buy). Having a controller that I could use in many situations actually wound up being quite nice. It’s a bit of a long shot, but I could see myself taking this to a friend's house who only games on a Mac, or going on a work trip and bringing a gaming laptop, or just connecting it to my Android phone for a quick Minecraft session. Sure, there are other Bluetooth-based controllers out there with similar versatility, but none of them come close to this level of polish. Inside the N30 Pro box is a micro-USB cable and a collectable key chain. Don’t get 8bitdo’s N30 Pro if you're looking for a controller that you only use on your PC at home. 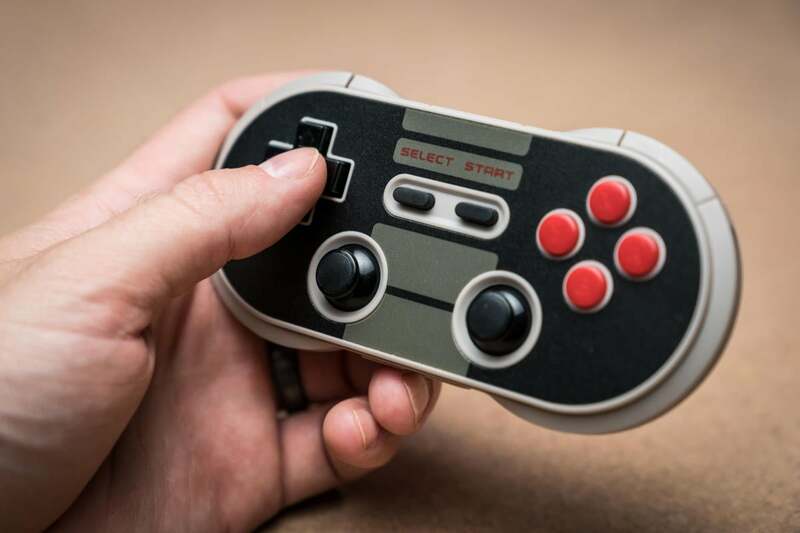 It’s more appealing if you want a solid controller that works in a variety of situations—especially if you have fond memories of Nintendo's classic NES system. The N30 Pro is a jack of all trades. And while it doesn’t master any of them, it’s a solid, well-built option that you can take and use almost anywhere. 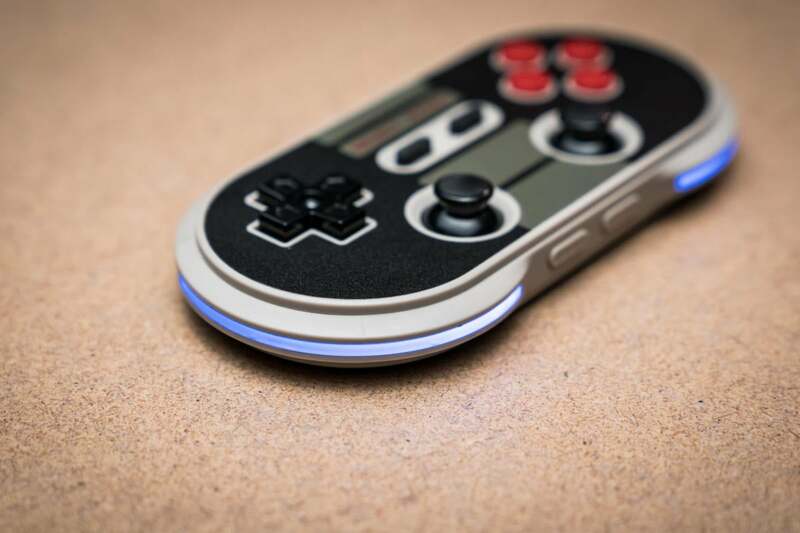 The 8bitdo NES30 Pro is designed to appeal to retro, indie, and blockbuster gamers alike—especially if you have fond memories of Nintendo's classic NES system. It's not perfect at any one thing, but it offers a solid controller that works well in a variety of situations.